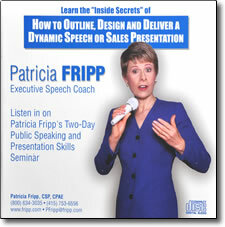 Learn how to craft a compelling speech or presentation from master presenter and executive speech coach, Patricia Fripp. What would it be worth for you to be considered a dynamic, persuasive, and compelling speaker? How would your business or career improve if you had the confidence of knowing that you can address an audience of five to five thousand people, and have them rave about your clear and impactful delivery? If you feel these skills would benefit your career, you will appreciate your investment in Patricia Fripp’s flagship home study speaking course, How to Outline, Design and Deliver a Dynamic Speech or Sales Presentation. Do you spend hours crafting a speech or sales presentation, and still have no idea where to start? Would you like to save time, and add more impact to your presentations, and build your confidence? Don’t worry, Patricia covers all this in great detail. Do you spend months getting an appointment to give a sales presentation, only to be beat out by someone else? By the end of the first CD, you will gain the inside secrets of being more effective than your competition. Do you realize that being available for speaking engagements in your community is a great way for you to gain exposure and promote your business? In this CD series, you’ll open a window to the hidden speaking opportunities that exist right in your community: how to approach them, and how to “wow” the audience once you get there. Perhaps you’ve been recently promoted and realize it will adversely affect your career unless you receive training on improving your presentation and speaking skills. This program simplifies and demystifies the process of designing a presentation for anyone who needs to speak in public. Executives, sales professionals, and even high-fee professional speakers have said they have undergone nothing less than a transformation in both their presentation skills and their content just by listening to this program. You’ll add marketing magnetism to business entrepreneurs, re-ignite careers for successful business people, and add marquee value to professional speakers. Learn about content development, connecting with your audience, and hear Fripp transform mini-presentations by attendees. Perfect for business leaders, sales professionals and professional speakers. Do you want to learn effective presentation skills? Do you need to deliver business presentations? Can you benefit from learning the latest presentation tips? Do you dream of becoming a professional public speaker or professional motivational speaker? Can you benefit from listening to presentation coaching? By the end of this comprehensive speaking and presenting course, you’ll be able to identify mistakes most speakers make and how to eliminate them; write, present and spice up a talk or sales presentation immediately, and use this new strength to your competitive advantage; recognize your strengths and cut years off your learning curve. You will never listen to a speaker the same way again.